Home News City No More Nukes! In the first half of the 1980s, UC students across the state became critical of the relationship between the institution and the country’s nuclear arsenal. Since the founding of Los Alamos National Laboratory in 1943, the UC regents fostered strong ties with the country’s creation of nuclear weapons. 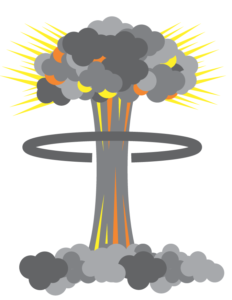 The bombs dropped in Hiroshima and Nagasaki were created by UC employees, in conjunction with the Atomic Energy Commission which later merged with the Department of Energy. Lawrence Livermore National Laboratory (LLNL), the nation’s second nuclear weapons manufacturer, was founded by the UC in 1952. UC Santa Cruz students, just 70 miles from Livermore, played a significant role in the direct actions against the regents’ ties with the facility. In alliance with the Livermore Action Group, many students were arrested at protests during this period. Campus demonstrations were also common. These displays of civil disobedience are embedded not only in the history of this campus, but also the larger national nuclear disarmament movement as a whole. June 1980: Over 100 nuclear disarmament protesters attend UC regents meeting to persuade them to sever ties with Los Alamos and LLNL. February 1982: First demonstration held at LLNL in over three years, 150 protesters arrested. Among them are UC Berkeley and UCSC students. June 20, 1983: UCSC students join in International Disarmament Day, a movement of thousands of protesters across 18 states. Over 900 people are arrested at a demonstration in Livermore and 33 at Lockheed Plant near Santa Cruz. Afterward, the Department of Energy places a 196-acre “buffer zone” around the lab. Spring 1984: UCSC Adlai Stevenson Program on Nuclear Policy is forms to discuss and educate the campus community about nuclear issues. March 1985: Students form the Student Alliance for Fallout Emergency (SAFE) and get a referendum placed on the spring ballot, requesting the Health Center to “stockpile suicide pills to be distributed on request to registered students in the event that the UCSC campus is exposed to lethal quantities of nuclear radiation.” The referendum also called for the creation of burial sites and radiation monitors at each college.